When Cathodion is put into the graveyard from the battlefield, gain . I think Blasting Station , Grinding Station , or Arcbound Ravager would be better sacrifice outlets. And Myr Moonvessel and Cathodion would also make good sacrifice fodder. 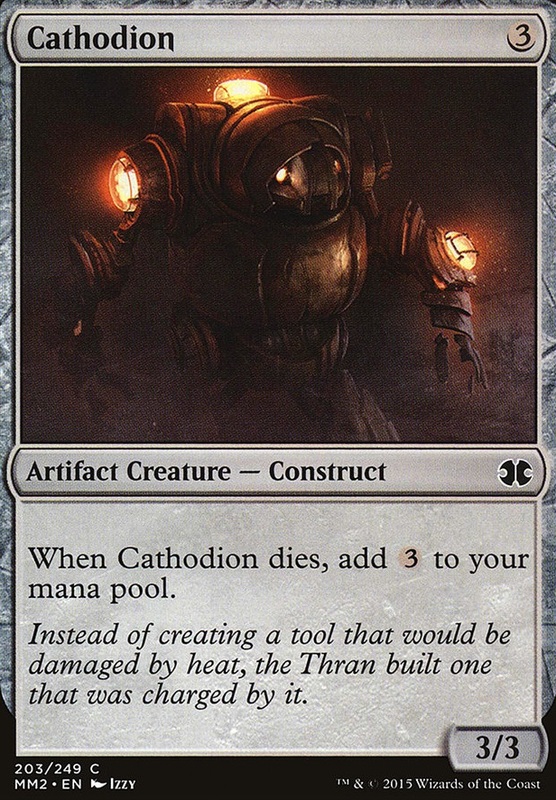 Im building a very juicy orzhov deck and need a bunch of creatures that give even or preferable more mana than their casting cost within the colors when they die (preferably do not sac themselves) The perfect example i have is Cathodion . Costs 3, gives 3 when it dies. You guys know any? SamsWrath, I think you are missing part of the point of this deck. The more noncreature cards we throw in the deck, the more chance we have of wasting two mana. This deck wants to minimize those chances in every way possible by ensuring any sorcery or instant it runs can be recurred from the graveyard by itself (thus we run Dread Return ). 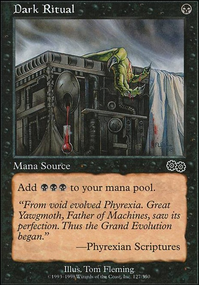 If we throw in Corpse Dance , Yawgmoth's Will and Demonic Tutor , then we're just asking for some dead flips that don't immediately impact the board. 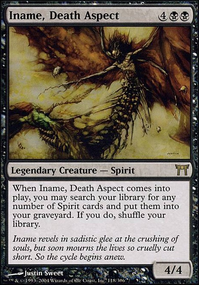 So I typically pass on any noncreature card unless it's an immensely powerful artifact (because it can be recurred through several of our creatures) or it can cast itself from the graveyard (flashback, retrace, etc.). As for Priest of Gix , he was removed as of the most recent build for Emrakul's Hatcher who is much more versatile. Cathodion doesn't in and of himself provide the mana for more flips and requires a sac outlet (which we typically get through flips), so he seems a little slow to me. 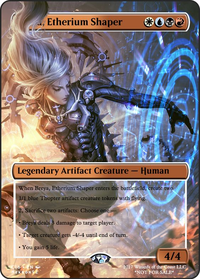 I either want creatures to have immediate impact once they hit or provide immense value for a delayed payoff; anything that doesn't meet either of these criteria is cut. As for Su-Chi , he's 4 power and I have a whole section in the primer detailing the importance of Grenzo being at X=1 (flip creatures of power 3 and below). Arcbound Reclaimer , however, has been on my radar for a while. I'm not a huge fan of putting the important piece to the top of our deck and potentially delaying when we can play it, but overall it could be worth it. I'll add it to the Maybeboard and will do some testing with it. SMASHER101 on Teysa, Ayli, Elenda, Ravos, Athreos, Krav, Regna.. Promise of Bunrei doesn't work with Teysa FYI. 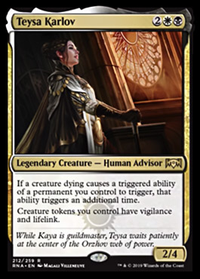 I think you should go all in on tokens, or only use things that make twice as many tokens because of Teysa. Playing around with Emerge in Pauper. The question is if I Emerge Cathodion can I use that mana to cast the creature?